The amp is loaded with 2 x 12-inch 100W Celestion speakers, paired with the 150W (75 watt per speaker) Valvestate amplifier in a combo unit. This amp features 2 x 12ax7 preamp tubes as well as solid-state poweramp circuitry. There are 16 onboard FX channels, including several reverbs, delay, chorus, flange, and various permutations. The amp features 4 channels – Acoustic Simulator, Clean, OD1 and OD2 along with 2 EQ sections – one for the clean channels, one for the OD channels. There is one Master volume, and one master presence knob. FX send/return, headphone out, mono/stereo emulated line out for direct recording. Includes power cable, 6 button LED footswitch to select channel and engage/disengage effects and original manual. This Marshall functions like new but there is some wear and tear on unit itself from light gigging (few scratches in vinyl on back and small tear on bottom). I have more pictures at http://www.flickr.com/photos/david-wallace/sets/72157618749063770/. I’d like to get at least $650 for her. I paid almost a $1,000 brand new. If you are interested, send email to david [at] davidwallace.com or call me at 602-300-6927. 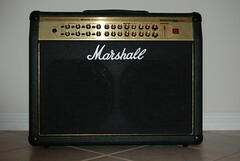 I will not ship this amp so you have to be in the Phoenix area (sorry).